No matter what type of fry you’re craving, we’ve got you covered. Burgers and fries. Fish and chips. No matter which side of the Atlantic Ocean you’re on, the potato always seems to play second fiddle. 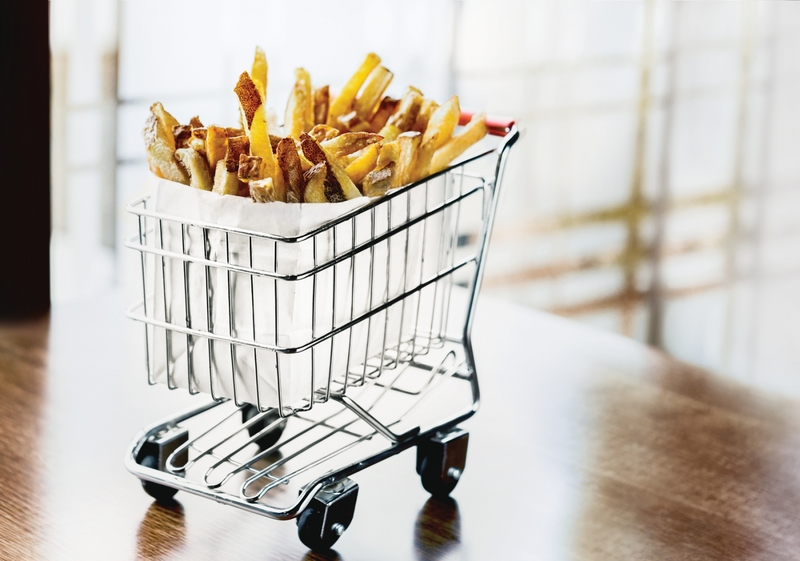 But, this month, we figured it was time for the french fry to step out of the shadows and into the spotlight. We highlight Edmonton eateries that serve up some spectacular spuds. Step aside, proteins – it’s time for the chips to shine. When burgers are the main focus of a restaurant – heck, when the word “burger” is right in the name – it’s easy for fries to become an afterthought. Thankfully, though, the potatoes have not been overlooked at Delux Burger Bar. The fries at Delux are la carte – in a couple of ways. Not only can you order them independent of your burger but, if you do, they will arrive at your table in a tiny little shopping cart. It’s a playful touch that matches the casual vibe of the eatery. Whether you order them on their own as an appetizer or pony up the extra dollar to have them as a side dish with your po’ boy sandwich, try the sweet potato fries at DaDeO at least once. In order to achieve the maximum crunch factor, the fries are battered first – a light coating, just enough to make them extra crispy. They’re liberally seasoned with a blend of Cajun spices, and the resulting fries are the perfect balance between heat and sweetness. And let’s not forget about the dipping sauce. DaDeO serves up its sweet potato fries with a herb mayonnaise; it’s so good that you may just run out before you’re done the last fry. 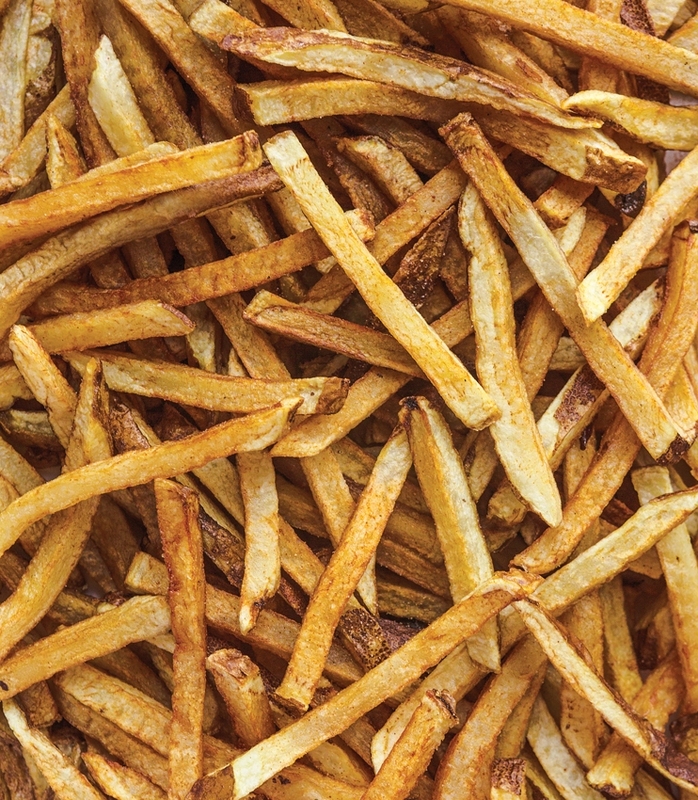 When you eat salty fries, there’s often an accompanying greasy feeling. But that’s not the case with Canteen’s house fries. The fries are salted so nicely that eating them by themselves would be good enough, and just as good as any fry covered in seasoning. What’s even better is biting into the fries’ crisp exterior – unlike some floppy fries floating around out there – and enjoying the soft, tasty insides. Sure, french fries make for a classic, traditional and reliable side dish but, sometimes, when the moon is full, these fried potatoes can transcend their meek side-dish status and unleash a flavour frenzy no protein on its own can achieve. At Daravara, the transformation happens when house-made hot sauce and chipotle cheese sauce are added to a heaping pile of classic cuts. Add to that some malt vinegar, chopped green onion and your choice of grilled chicken, house-smoked bacon or coffee-rubbed brisket, and this once mild-mannered dish becomes a wild and rarely experienced palate-pleaser. Go to the United States, and a lot of the best barbecue joints are just as famous for their sides as they are for their briskets and ribs. Likewise, at Meat, a lot of thought has gone into the sides. If you order these fries expecting a dusting of garlic powder, you’re in for a surprise – they actually pack a massive garlic punch. In fact, instead of dipping sauce, it might be an idea to fill a ramekin with Listerine and serve it on the side. After all, these delicious, crunchy and super-garlicky fries are definitely a signature item, but they could ruin a date night. No kissing after even a couple of bites.